Just when I think I’m almost caught up with writing about all the “new” releases and think I’m going to be able to write about some older movies, all of these movies start catching my eye. On the one hand, I’m glad this year isn’t a repeat of 2011, which I think was one of the worst years I remember for movies, but on the other hand, it makes me wish I had taken advantage of all that awfulness and been more diligent about blogging back then. 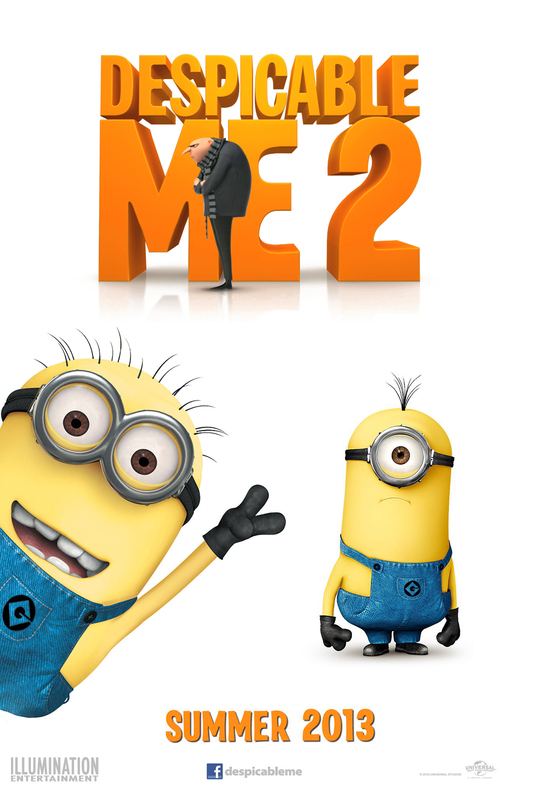 Getting on track though, let’s talk Despicable Me 2. I actually wasn’t too impressed by the first Despicable Me (2010), but let’s be real—it’s hard not to love Gru’s Minions. In fact, I’d like to say that was the only reason I thought the first was even bearable to watch. I have a feeling the animators thought the same thing, so there was definitely more scenes with Minions in them this time around, which I do think was a smart move; the movie would have been incredibly boring without them, just like the first. I don’t have much further to add other than the ending had my rolling over pretty hard with laughter. Not sure what my next review will cover; I know I still have some books I’d like to review, some more recent movies, and of course the “older” topics that I keep putting off. At some point I’d like to freshen up the look for this site too, but not sure when that will be either. So many to-dos! We’ll see how the next few days go, haha. I’m hesitant to see this one because I wasn’t overly in love with Despicable Me either; it wasn’t really fair to consider that a good animated movie as it came out at almost the same time as Toy Story 3. Haha, well, I barely remember To Story 3. The only part I remember distinctly was “The Claw,” and my friends cracking up at me because I said “The Claw!!! !” in toy martian-speak right before The Claw itself showed up, hahaha. And I was cracking up because they found it funny and I hadn’t meant for my comment to be such; I just got a little too into the movie at that moment. Part of me thought there was a chance they were actually going to meet their doom, hahaha. For some reason, I’m basically expecting myself to sit in the theater, basically waiting for a funny scene I saw in the trailer to come up. I almost worry this movie will be a second Shrek in that in might wind up with far too many sequels for its own good after the studio hit gold with the first one. You mean the “Bottom” part? Hahaha. That part was still pretty funny. I think you’re right though, I wouldn’t be surprised if there were a ton of sequels after this. I mean, look what happened to Ice Age. I didn’t care much for the first flick, so obviously you can guess what my reaction to this one was. Good review Rae. Hahaha, yes, I think I can. Thanks! You going to watch Turbo? I feel like it might be pretty terrible, but I did promise kids of a family friend that I’d watch it with them, so hopefully it has some redeeming qualities to it. I think I liked the first film better as we got to see evil Gru. Although, my boy loved all the scenes with the minions in this second installment. Word on the street is they are making a minion solo film. LOL! You know, I wonder about a minion-only movie. Would it be effective? Would it need subtitles? I don’t know how entertaining they’d be as a solo act. I almost wonder if Gru and company are necessary to make it work. It’ll be an interesting thing to see.